Can Obama save an endangered Endangered Species Act? Obama’s promise of change can’t come too soon for some of the Bush administration’s most lowly constituents. After all, humans aren't the only living things subject to our government. But because they can’t vote, can't form an opinion on a campaign platform, our country's four-legged residents are even more vulnerable than we are. 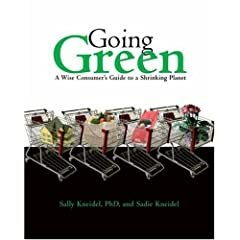 In his last months in office, Bush has turned his attention to a humble target often overlooked in the current “going green” craze. Unbeknownst to them, the future of our wild neighbors are the seriously threatened by a recent proposed change to the Endangered Species Act. Currently, federal agencies are required to consult scientists at the Fish and Wildlife Service or the National Marine Fisheries Service to determine the potential impact of proposed projects – such as oil drilling - on threatened species and habitats. The Department of Interior insists that eliminating this consultation would streamline the conservation process. And indeed, the new requirement that projects have a “direct” impact on endangered species in order to be assessed would certainly eliminate many previously regulated projects. However, it would also mean that indirect effects on species and habitat - such as climate change - could not be taken into account when assessing the impact of a proposed project. How convenient, just as the conflict between our climate change and country’s ecological footprint is coming under public scrutiny. Incredibly, this proposal would allow agencies to determine the impact of their own actions, with no external assessment. That sounds about as effective as asking drivers to voluntarily decide whether their own driving habits contribute to global warming or not! According to former U.S. Forest Service ecologist Robert Mrowka, it’s like “the fox guarding the hen house." Bush’s last-minute proposition, just months before his departure from office, suggests an assumption that he will be followed by a sympathetic successor. When questioned, McCain had no comment to offer on the proposed revisions. Meanwhile, Obama responded in a manner consistent with his message of change. "This 11th-hour ruling from the Bush administration is highly problematic,” said Obama campaign spokesman Nick Shapiro. "….As president, Senator Obama will fight to maintain the strong protections of the Endangered Species Act and undo this proposal from President Bush." But will it be too late? For some of our furry neighbors I fear it may be. Exhausted by hours of politics and propaganda, after investigating this legislation for hours I left my computer and stepped out into the warm North Carolina night for a restorative walk. Speaking loudly over the resplendent chorus of thousands of cicadas, katydids, and crickets, I tried to explain to my partner Matt my distress over the politics I’ve been reading about. Suddenly, I broke off in shocked mid-sentence. Just a few feet over my head, a bat glided into an oak branch, cutting off a cicada in mid-chirp. The cicada and the bat fell out of the tree, wrestling in mid air. The cicada squealed shrilly. After a moment’s fierce fight the cicada darted away, too stunned to chirp, and the bat swept sulkily off, in search of perhaps less feisty prey. Matt and I stared at each other, dazzled. Nature, red in tooth and claw! Suddenly, my frustration fell into perspective. Such moments are, after all, why I do what I do. My hours devoted to dissecting Obama and McCain’s environmental policies are for the sake of my neighbors like this bat: perhaps one of the Gray Bats, Indiana Bats, or Virginia Big-Eared Bats currently endangered in my state. After all, these species, like dozens others, are more threatened even than I by the uncertain future of our government. China has received kudos worldwide for a green Olympics. They've used the latest innovations in sustainable architecture, energy and landscaping for the 2008 Olympic Village in Beijing (see our previous post by Juliana Sloane). Given the media coverage of the Olympics, such efforts will go a long way in improving the world's impressions of China's environmental scorecard. China's choices for the Olympic village are commendable, in that they've set a precedent for future Olympic villages and other major construction projects, and they've also publicly validated that "green" is a goal to be proud of, for all of us. But the green Olympic Village is a bit of smoke screen for China. The reality is that China is the world's most polluted nation. According to Peter Navarro of UC-Irvine, 70 percent of China's major rivers are severely polluted, 80 percent of its rivers fail to meet standards for fishing, and 90 percent of its cities suffer from water pollution. As a result, over half of China's people drink foul water of a quality well below World Health Organization standards. Not surprisingly, liver and stomach cancers are leading causes of death in the Chinese countryside. The widespread water-pollution problem was evident even in the Olympics, although not widely publicized. One third of the Olympic sailing course was closed for sailing practice due to massive algal blooms which the Chinese scrambled to contain. 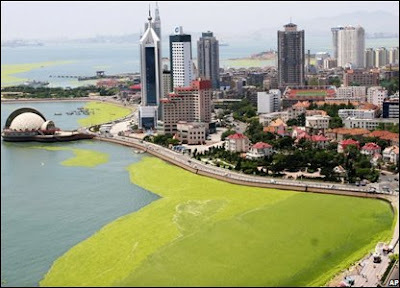 Algal blooms are a rampant problem from China's overuse of fertilizers, which flood into rivers and streams. When the algae decay, the bacteria use all the oxygen in rivers and lakes, killing fish and other aquatic life, while the high nitrogen levels from fertilizers are dangerous and can be lethal to humans. China's pollution of its waters is only one aspect of its frightening environmental performance. According to Worldwatch Institute, worldwide carbon emissions increased 22% between 2000 and 2007, and China accounted for a whopping 57% of that growth. China's recent industrialization has been explosive and unprecedented. Because of their huge human populations, the coal-dependent development of China and India is the biggest driver of growth in global carbon emissions. China's fossil-fuel emissions passed those of the United States this year, reports the United Nations Environmental Program. Stabilizing our global climate will require that industrialized and heavily polluting countries like the United States move to low-carbon energy sources, and that rapidly expanding nations like China and India pursue cleaner energy development. But China's economy will grow faster if its industries are allowed to minimize costs and maximize profits; in other words, if they're allowed to burn the cheapest fuels, such as coal, and skip the expensive scrubbers that can remove pollutants from smokestack emissions. And just like the United States, China prefers the prosperity of rapid economic growth. I wonder if China's motivation for hosting the Olympics was, at least in part, the opportunity to divert attention from their growing contributions to our planet's climatic plight. With a population more than 4 times that of the U.S., their potential for future damage dwarfs our own. On the bright side, international action to protect our climate is intensifying. In December 2007, the 192 parties to the United Nations Framework Convention on Climate Change agreed to establish a new global climate change agreement by 2009. This will build on the existing Kyoto Protocol, which commits industrial countries to reduce green­house gas emissions to 6-8 percent below their 1990 levels. The current Kyoto Protocol has not been adopted by dev­eloping countries such as China or by the United States. We must all work toward the compliance of these biggest offenders with the new agreement of 2009, starting with the candidates we choose in November. Perhaps one day the green face that countries present to the world stage will truly represent a greener way of guarding our rivers, our air, our future. Maybe we'll celebrate our Olympics of the year 2052 in a world where carbon emissions have stabilized and lakes aren't clogged with algae. James Russell, Worldwatch Institute. "Carbon Emissions on the Rise But Policies Growing Too." August 6, 2008. 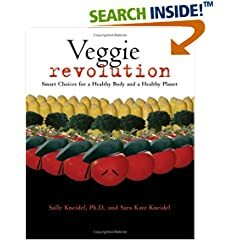 Reuters, the Atlanta Journal Constitution, and Basil & Spice syndicated this Veggie Rev post - click here to see it on Reuters! Despite its official opening against a thick backdrop of smog several weeks ago, the Beijing Olympic Village has become iconic of the city's efforts to embody a "Green Olympics". With features such as a 6,000 sq. m. rooftop solar heating system designed to provide hot bath water for the 17,200 competing athletes, as well as a "near-zero energy" welcome center that takes advantage of both solar and geothermal power, the Village makes the most of the latest innovations in sustainable architecture, energy, and landscaping. Receiving glowing reviews all-around, could the Beijing Olympic Village be an indicator of a new category of Olympic competition? Could a race not for Gold medals, but for greener, more sustainable development within host-cities be afoot? The buzz of enthusiasm centered on the Olympic Village culminated in the green building industry's own variety of Gold medal- the LEED (Leadership in Energy and Environmental Design) Gold Award- which was presented to the Village's head, Chen Zhili, last Wednesday. This is the first residential building in Beijing to win a LEED Gold; further increasing the prestige of the Village which is slated to be transformed into luxury apartments after the games. Perhaps hoping to best Beijing's work towards going green for the Olympics, plans are already being set into motion for the Winter 2010 games in Vancouver, B.C., and the Summer 2012 games in London. In Vancouver, two Olympic villages will be built in compliance with LEED gold (and according to planners, hopefully platinum) standards. Afterwards both sites will be developed as "model sustainable communities"—this time with the focus shifting more toward reasonably priced housing. Of the 1,100 residential units, 250 will be slated as "affordable housing" and 110 more will be deemed "modest market" housing. While fewer concrete decisions have been made about the next summer games in London, there is a push by groups such as Carfree UK to keep the Olympic Village a car-free zone after the games. With housing, shops, and other attractions located within distances easily managed on foot or by bike, London's Olympic Village is expected to play a role in larger revitalization plans for the Stratford City area. The 3,300 new homes anticipated to follow the 2012 games will also include a mix of affordable sale and rental housing, all with green features. If these developments are any indication, green building enthusiasts may have as much to look forward to in future Olympic Games as sports fans as Beijing raises the bar for eco-friendly Olympic architecture. A friend of Sadie's, Juliana Sloane is a freelance writer with an MA in Gender Studies from Central European University in Budapest, Hungary. With varied interests ranging from gender in the post-state socialist context to community media to natural foods and sustainability issues, Sloane has has found herself in a variety of occupations. Previous incarnations have included development assistant and host of weekend programming with NPR affiliate 88.5 WFDD in North Carolina and assistant to the Executive Director of San Francisco's Institute For Unpopular Culture. She has recently moved back to North Carolina from Hungary and spends her time working at a local natural foods co-op and pining for good espresso. After our frolic in Peru (see the last few posts), we had an "adventure" of a different kind much closer to home. Last weekend, my husband Ken met up with two yellowjackets who almost killed him, on a 3-day camping trip. The event rattled our cages pretty profoundly. I decided to write this post to share what we learned from the experience. Ken's a biology teacher who understands the immune system thoroughly and I'm an environmental writer, yet neither of us was prepared for the events that unfolded after the yellowjackets nailed him. 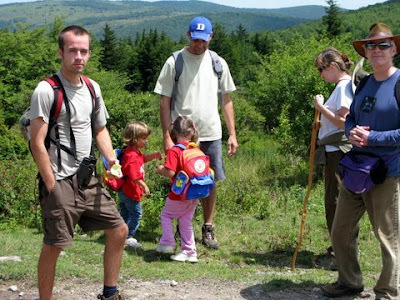 We were at Grayson Highlands State Park in Virginia with our extended family and some friends. It's a great park for camping and mountain hiking, with Mount Rogers, the highest point in Virginia at 5,729 feet. Our family meets there every August, when the wild blueberries along the trails are ripe and the nights offer meteor showers. The kids love the wild ponies at Massie Gap. ponies at Massie Gap in Grayson Highlands State Park, Va.
Ken's unfortunate encounter with the yellowjackets happened when he went into the woods to get sticks for a campfire and yanked a dead stick dangling from a tree. He disturbed a nest of yellowjackets in the tree; they stung him once on his ear and once on the side of the neck. About 25 years ago Ken was stung by some kind of wasp about 20 times while helping with his advisor's field research at UNC. 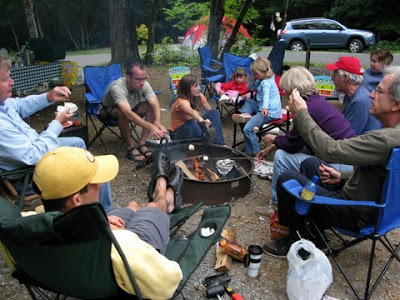 About 12 years ago, the same thing happened on an earlier version of this same annual family camping trip. After that second time Ken got a rash about a week after the stings; his doctor told him it was an allergic reaction and he should carry an EpiPen. So Ken got an EpiPen and for years he took it on trips. As the years went by we both began to doubt that Ken really was allergic. He was stung by a honeybee a couple of times and nothing happened. (Turns out people who are allergic to wasps are usually not allergic to honeybees...but nobody ever told us that). We both got pretty lackadaisical about his carrying an EpiPen. We didn't even take one to Peru. Over the years he's been bucking through brush while birding or walking in the woods; in Peru he was off alone in the rain forest with all kinds of wasps around him. We know now he's been taking big chances over and over. When Ken got stung last weekend in the woods, his first action was to run up the hill to the campsite. He said he was scared because the neck sting was right over his carotid artery, the artery carrying blood to the head and brain. At the time of the sting - late afternoon - most of our family and friends were still out hiking. Only myself and our daughter Sadie were at the campsite, along with my sister-in-law Marty. Ken took two Benadryl tablets as Marty ran off to ask other campers for an EpiPen. Then he sat down in a camp chair with an improvised ice-pack, but just a few seconds later he called out to Sadie and me that he was "losing it" and that it was "happening fast." He pleaded with us to get help and especially to find an EpiPen somewhere. Then he did lose it - Sadie ran to catch him as he passed out. His eyes were still open, but his face was gray and he went completely limp and unresponsive. We didn't know if he was dead or alive. As we learned later, he was in anaphylactic shock. All that happened in the first 5 minutes after he was stung. I was completely freaked out. What to do? There was no one close by. But we couldn't leave him. The only thing to do was scream for help. So we did. Sadie and I screamed "medical emergency, help!!" and "911" over and over as loud as we could. Within a minute, two campers pulled into a campsite about 100 feet away - they were both emergency medical technicians! But they had no gear with them. Still, they recognized anaphylactic shock and a plunging blood pressure and knew that Ken had to lie down - he had no detectable pulse at all. He was alive, but his blood pressure had plunged to about 50, too weak to feel it in his wrist or neck. Cool-thinking Sadie suggested putting Ken in the van and driving him up to the camp store where there's a phone, where we could find the rangers and call an ambulance. Travis the EMT and a friend who had shown up carried Ken to the van. Sadie drove the van, with Travis tending to Ken, up the hill to the ranger station, passing a woman walking along the road with her husband. The woman was headed to the camp store too, and amazingly she was carrying 3 EpiPens in her pocket. She has asthma and always keeps them with her, she told us later. She heard Sadie and me yelling for an EpiPen and a few seconds after we arrived at the camp store, she gave us one. I can't describe the relief we felt. Travis stabbed the EpiPen into Ken's thigh (still lying in the van) and Ken cried out in pain - it's a hefty needle. Ken opened his eyes immediately but was still only semiconscious. After a couple more minutes though he regained consciousness and was able to respond weakly to our voices and touches. He lay in the van for another 45 minutes while a volunteer ambulance made its way to the campground over the narrow mountain roads. Travis kept his fingers on Ken's wrist feeling for a pulse. I was running from person to person, spitting out questions like a nut case - questions no one could answer, like "is he gonna be all right???" We did what had to be done, as a group, but it wasn't because I was calm and collected. I was frantic. At one point our friend Fred came up behind me and just grabbed me by the shoulders and held me for a moment, just to make me stand still. That really helped me get a grip. When the ambulance finally arrived, it was another 45 minute drive to a hospital. 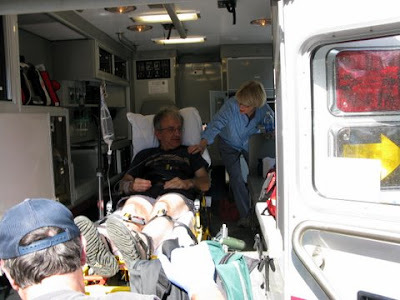 Ken was conscious by the time the ambulance came, thanks to the EpiPen. The ambulance EMTs gave Ken an IV that helped restore his blood pressure, and by the time we arrived at the hospital, his face had pinked up. His blood pressure had risen to 80 when they first measured it in the ER. The hospital doctor said he would have died if he hadn't gotten the EpiPen. She ordered Prednisone or Decadron or some other steriod injected into his IV, to suppress his immune system, plus an H2 blocker, Tagamet. (Who knew Tagamet and Pepsid are histamine blockers?) After Ken's blood pressure was back up to 105, they released him from the hospital with a handful of prescriptions. So…all's well that ends well. We've been shaken the last few days - Ken, Sadie, and myself. Unfortunately, school started this week, which is always a sort of stressful week. Sometimes we're not sure where the stress is coming from - work, or our continuous need to review the events of the fateful weekend. Ken's carrying an EpiPen everywhere now and will start desensitization therapy in a couple of weeks. This is a very successful procedure for reducing or eliminating wasp allergies. He'll get increasing doses of wasp venom weekly, then monthly, for several years (starting at about 1/1000th of one sting). The weekly trips will be inconvenient, but he can't live his life the way he wants to in constant fear of wasps. This past week, it's been frightening for him being outside and seeing wasps flying around. He says he feels like someone at Yellowstone brushing by a grizzly bear every few minutes. For me, I've never been afraid of any animal (and never has Ken really) - even the various vipers we've seen in the tropics. But I am now. My heart will skip a beat every time I see a wasp, I think, from here on out. Note about yellowjackets: Yellowjackets and hornets are in the insect family Vespidae. They are both types of wasps. Vespidae is just one of several wasp families. We identified the species of yellowjackets that stung Ken by using the photo at the top of this post, which my brother Richard Stenhouse took. It's the Common Aerial Yellowjacket, Dolichovespula arenaria. The website http://bugguide.net helped us identify it (use the search window on the website). In general, yellowjackets have yellow and black striped abdomens, while hornets are largely black. A child in the Amazon village of Comandancia. I really want to help Rosa. Especially since I'll be helping the rainforest and Amazonian villages at the same time. We met Rosa Vasquez in Peru in June, when we stayed at her family's hostel in Iquitos, Hospedaje La Pascana. Rosa runs a travel agency at the hostel and she's really good at it. She helped us change a lot of our travel plans after we left the Amazon, giving us great advice for the Andes which I've mentioned in my last 3 posts. I'm very grateful to her for that help. It made a huge difference in our trip. But Rosa, as we are learning, is a lot more than a travel agent. She's also an environmental activist and humanitarian. I just found out today that she serves on the board of a ACDA, a highly-regarded nonprofit that promotes health and sustainability in Peru. Right now Rosa is focused on five remote villages along a tributary of the Amazon River. An Amazon home near the village of Yanashi. A monk saki monkey in Peruvian Amazonia. Rosa's project is a health fair this September for the 900 people living in these five villages. The health fair will provide not only dental care and basic health care, but also reproductive health care and family planning, services that the villagers are eager to have. Rosa sent me some info today from ACDA, advertising the health fair. The e-mail pointed out that the Amazon rainforest is the lungs of planet Earth. It said that ACDA is working to reduce the stress of human impact on the rainforest by educating and training local villagers to become stewards and conservationists of the forest, for the benefit of the world as a whole. "The health of the rainforest of this region depends on the health of these villagers who are trained to protect it," says the e-mail. Rosa and ACDA are right - the connection between family planning and stewardship is well established. All over the world, smaller families are more likely to be able to provide for all of their children's needs and send their children to school, where they can learn about choices in using natural resources. Right now, many or most Amazonian families rely on logging as their primary income - a practice that pays them very little, is dangerous, and is destroying the rainforest at an accelerating rate. This was something we learned and observed when we were there. Anytime we took our skiff out on the river, we passed local people floating downriver on rafts made of logs they were taking to sawmills. We passed the sawmills too. Sometimes we passed a single man standing on just one huge tree trunk, or a section of it. Just floating down the river to sell the wood. We didn't blame them, I don't mean it that way. They were doing what they felt they need to do to support their families. A man floating a piece of tree trunk downriver to a sawmill, on a tributary of the Amazon River. Not surprisingly, ACDA's health fair is sponsored by the Rainforest Conservation Fund. And by Planned Parenthood South America. Ken and I have promised Rosa $50 for the health fair. Rosa's phone numbers, from the United States,are 011.51.65.236.002 and 011.51.65. 233.466. Her email address is reservas@pascana.com. Call or email her if you'd like to make a donation. You can also support this project by making a tax-deductible donation to the all-volunteer Rainforest Conservation Fund. Click here for the RCF webpage about how to make a donation. My post about our trip to the Amazon is here. "How much farther is it?" someone whimpered. Our rear ends were aching, jammed into another Peruvian taxi - older cars that have lost most of their seat padding and shock absorbers. But the views out the window soon distracted us from our discomfort. Our jaunt through the Andes in the taxi, from Huaraz to Llanganuco Lodge, was so scenic I was soon beside myself. I exclaimed on and on about the sights like I'd had way too much coffee - sometimes to the annoyance of my fellow passengers. The taxi bounced across luscious green and brown slopes, past occasional adobe homes with plots of potatoes or corn, past sheer rock cliffs. 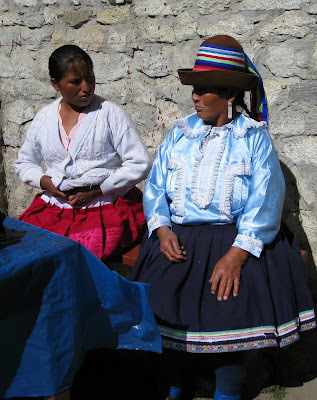 Quechua women in brilliant clothing sauntered along the narrow curving road, or worked the vegetable gardens with their husbands. Beyond the slopes were snowy peaks, among the world's highest. I tried to memorize the whole thing: the landscape and the thrill, for me, of being in Peru instead of behind my desk at work. It was worth 10 months of slogging at the job for a couple of weeks of this. Compared to Europe or the U.S., Peru is a pretty economical destination. Our travel agent in Iquitos, Rosa Vasquez Zanetti, turned us on to some great Peruvian places with great Peruvian prices. As we jostled along in the taxi, we were intrigued to find that our driver Juan's first language was Quechua. We begged him to teach us some words and he complied. Hello is yameyocko, he said. Yes is ohmee. No is mana. Mother is mama, oddly. At least I'll remember that one. Juan even told us how to say "Can I take your picture?" - Oto hotootah tomarishkekee - one of my necessary phrases in Peru. After two and half hours, we pulled into Llanganuco Lodge at the end of Huandoy Valley. Charlie Good, the British owner of the lodge, welcomed us with his beloved pooch, Shackleton. The rooms were nice - hot water from a tankless gas heater, and duvets on each bed. At 11,500 feet, the nights are chilly. Charlie is a young economist from London who gave up the rat race to pursue his dream, and he's doing a good job of it. He offers gear for climbing and rappelling, and he's created a bunch of hiking trails around the lodge, one to a glacier, and some that provide views of soaring Andean Condors (click here to see on youtube). We saw a lot of birds at Llanganuco, including the Giant Conebill, Giant Hummingbird, Great Thrush, Puna Ibis, and Andean Goose. 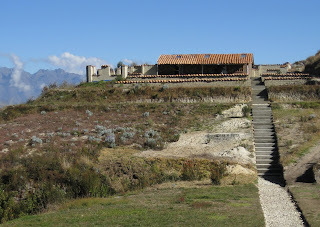 I'll give more details about birding near Charlie's Llanganuco Lodge in a later post. Charlie is also involved in the challenges facing the local Quechua farmers. He wrote a great piece about the threats to the Quechuan rural culture that appeared in a Huaraz magazine. I'll reprint that piece in a later post too. We'd started taking Diamox the day before we left Lima for the Andes. It's the most popular medicine for treating and preventing altitude sickness. It works by making you breathe faster, which compensates for the reduced oxygen in the higher air. My brothers had used it on hikes in Colorado and they said it worked. The day after we arrived at Llanganuco Lodge, we called a taxi from Yungay to come get us and take us to Lake Llanganuco, a very big lake in Huascarán National Park. It was a walkable distance from the lodge to the lake, but involved a 1000 ft rise in altitude - too much exertion for the first day at 12,500 feet, even with the Diamox. We planned to walk back from the lake to the lodge instead, which would be all downhill. 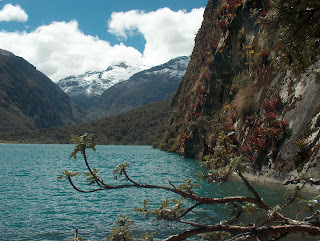 The day at Lake Llanganuco was one of the happiest days of my entire life. I know I said something similar about Huaraz, but here it is again. This day was even better. On the way up to the lake, in the taxi, we had to stop at the park office to pay an entry fee, and we spotted a Quechuan family who had a food-stand outside the office. They were selling whole baked potatoes and baked corn from their garden. We bought a couple of hot potatoes to munch on, and they let me take their pictures. 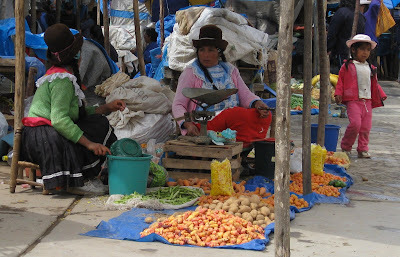 But even more interesting than the lake, to me, were two groups of local Quechuan women who had set up shop under the two shelters in the picnic area next to the lake. Yay!! I was so excited. 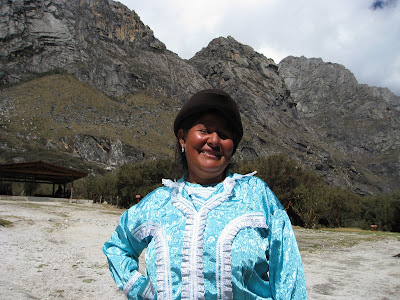 Now was my chance to get to really talk to some Andean people and take some pics, if they'd let me. And if they spoke Spanish. They did. The first group was cooking lunch to sell to hikers and lake visitors. 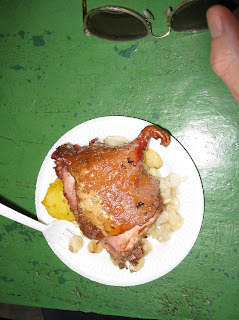 The selection: roasted or fried guinea pig, crunchy corn kernels cooked in oil, similar to corn nuts but a lot better, potatoes, corn on the cob, greens, tomatoes, and fried unleavened bread that was so good it made me giddy. 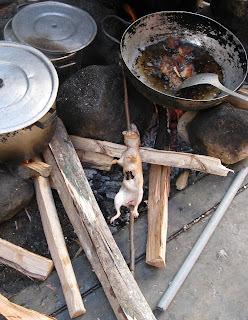 One of several women sharing a fire to cook guinea pig, etc. I did my best to engage the guinea-pig-roasters in conversation, but they were busy cooking and tending a small child who was unhappy with the smoke in his eyes. I tried to amuse the child so the women could work, but he was afraid of me with my light hair and freckled face. So I gave up on that. I decided to try my luck with the second group of women, who were selling woven hats and scarves and gloves. They too had a fire going, but it was only to heat water for the mate de coca tea they were selling, made of brewed coca leaves - a tradition in the Andes since Inca days. They weren't nearly as busy as the women who were cooking, and they had no children to distract them. I was in luck. I made friends right away with Maria, a jovial Quechua woman who tried to get me to buy a hat, and modeled an assortment of hats to win me over. First hat above, second hat right. Maria looked lovely in both. I only wish I had her address to send her prints. After the hat modeling, I had to buy a cup of hot tea from the gals, and a bag of leaves for later tea-making. (I was interested to learn that coca leaves alone have no excitatory or intoxicating properties. But they do have a lot of medicinal properties.) I then proposed some general photo-taking of whoever was interested. All six of the women selling hats jumped up, peeled off their fleeces and comfy clothes, and put on their Quechuan finery. About that time Sadie wandered up from her trek around the lake, and joined in the fun. She too had to have a cup of tea, and procure a bag of tea leaves for later. Sadie was a good addition to such a gathering because her Spanish is flawless and her social skills are better than mine too. We were hummin' along. Photo below: Tucking in the finery for a pose. When Sadie ambled away to prepare for our upcoming hike, the women waved goodbye like old friends (below). We ate some lunch (yes, some of our family tried the guinea pig) then took off down the trail through Huascarán National Park back to Llanganuco Lodge. We hiked through a forest of red Polylepis trees, which are endemic to high altitudes in the Andes. Polylepis forests are disappearing, we learned, because of population growth and increasing demands on the land. Below, four photos of the Polylepis forest by Alan Kneidel. In the second photo, a Giant Conebill forages on the tree trunk. In this picture, Puya bromeliads are visible on the Polylepis trees. The trail followed the stream that ran through the forest between these cliffs. Hiking through the red trees between monstrous cliffs was fun, but I'm not sure we were quite ready for the altitude factor. The trail was covered with rocks in places and was hard to walk on. 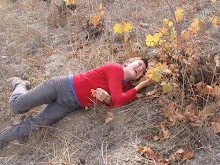 As I discovered later, one symptom of altitude sickness is "loss of coordination" and I may have had that affliction, because I had to go at a snail's pace to keep from breaking my leg. Another symptom is fatigue, and I was definitely experiencing that. By the time we made it back down to the park office where I'd photographed the food vendors, I was completely exhausted. But we pressed on. We met some boys on a dirt road with their llama, and that seemed to revive me. Just before dark, we made it back to Llanganuco Lodge. I popped another Diamox and got ready for our gourmet dinner, cooked by Tito, a friendly local guy who whipped up the meals at the lodge. I was ready that night for our free shot of pisco. However, one of us who hadn't taken any Diamox that day missed dinner and instead spent the evening hours hugging the toilet bowl. Luckily Llanganuco Lodge has great toilets. Was it altitude sickness? I don't know...nausea is one of the first symptoms. Or maybe it was the guinea pig, which wasn't really entirely cooked. At any rate, it wasn't our first date with johnny on the trip. In the Amazon, we'd had several days of erupting from either end, or both. No matter, after a couple more days of hiking and birding around the picturesque Llanganuco Lodge area, we were telling Charlie goodbye and heading back to Lima for the final leg of our Peru blast...the desert coast along the Pacific. Specifically, we were off to bird the Reserva Nacional de Paracas and Islas Ballestas.